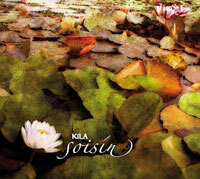 This is the ninth studio album from trad/fusion band Kila and portrays their softer side. Entirely instrumental, the music is gentle, slow and beautiful. Playing together for nearly twenty years, KÌla are one of Ireland's most innovative and exciting bands. The members come from different musical backgrounds, but share a passion to create great music, with an ability to absorb influences from across the globe. With roots in traditional Irish, Kila's music features strong percussive-like singing, with gorgeous melodies driven by a serious rhythmical undercurrent. KÌla have created their own distinctive style of World music, which has won over audiences around the world through their recordings to date and their spectacular live performances. Made up of two sets of brothers, Kila are Eoin Dillon (uilleann pipes, whistles), Ronan O'Snodaigh (bodhran, percussion), Rossa O'Snodaigh (guitar, whistle, percussion, piano, bouzouki, trumpets, clarinet, mandolin), Dee Armstrong (fiddles, banjo, vocals, violins, glockenspiel, free-notes), Colm O'Snodaigh (guitars, flute, whistles, vocals, harmonica), Lance Hogan (guitar) and Eoin O'Brien (guitars). Also featuring Martin Brunsden (bass, saw), Karl Odlum (bass, drum), Paula Hughes (cello), Peter Browne (accordion), John Browne (drums) and Sallay Garnett (vocals).